Considering an escape somewhere in the hills with civets and langurs for a company? Binsar Forest Retreat located in Uttarakhand is what your dreams are made of. 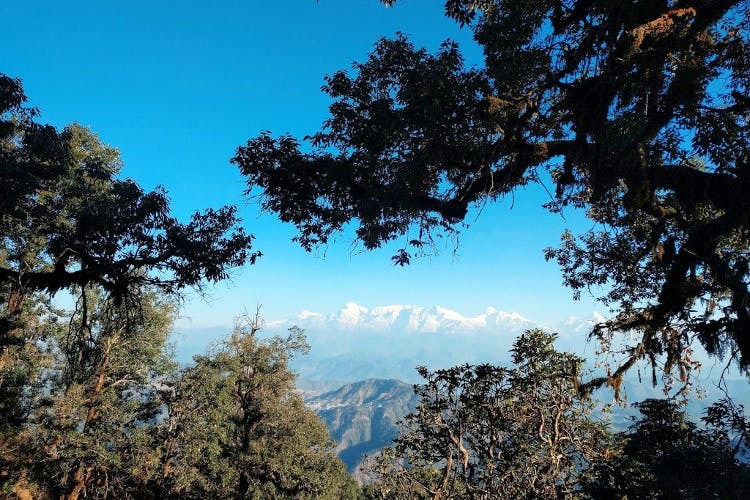 Tearjerking sunrises, comfort (And extremely delicious) food, star-studded sky, conversations over bonfire are a few things that describe Binsar Forest Retreat. Concealed inside the dense Binsar Wildlife Sanctuary, this homestay is a world of its own, and once you enter, you wouldn’t want to step out. As you enter the stay, you’ll be welcomed by the happy barks of the resident cuties — Tara and Chanda. The common dining area of the stay is full of books on travel, classic fiction, and comics. They stay offers around six types of rooms, and all of them are eco-friendly and designed with wooden interiors (wooden floors too). The Nandaghunti Rooms are the ones with the best view as you can see the peaks of Nanda Devi. Plus, it has boundless greenery around it. All the rooms come with a balcony (Or a patio). So, watch out for langurs or listen to the sound of civets frolicking on the rooftop. Right from continental dishes like pasta to sweets like Shahi Tukda (Bring them on) and Apple Jalebi to experimental soups like Popcorn soup, meals here are hearty. It’s a common dining area, so you’ll be breaking bread with a bunch of strangers and become friends over a warm bonfire night. The Nandaghunti rooms cost you between INR 8,000-10,00 per night that includes four meals, morning coffee, daily trail guide walks, etc. While there are no strenuous treks here, the good people at the retreat offer sunrise and sunset walks that take you through thick foliages of the jungle. On your way, spot the Panchashuli peaks and wild boars, but also birds that are rare to find in the cities. Getting there: Take a Shatabdi (5 hours) or Ranikhet Express (an overnight train) from Delhi and reach Kathgodam. From Kathgodam, you can hire a shared cab (INR 500 per head) or a private taxi (INR 2,500) and reach Binsar in 6-7 hours.